The Nice Guys is a film that could have been done much better, but at least Crowe and Gosling elevate it to a more than tolerable level. Despite the many laughs, The Nice Guys is highly uneven on multiple levels. On the upside, The Nice Guys revives the odd couple / forced-to-be-buddies genre, bringing to mind films such as Beverly Hills Cop with Eddie Murphy and Judge Reinhold, and Lethal Weapon with Mel Gibson and Danny Glover. Based on Mitch Cullin's 2005 novel A Slight Trick of the Mind, Mr. Holmes is not your typical crime-mystery. The film, which was directed by Bill Condon and adapted to the screen by Jeffrey Hatcher, is more of a psychological exploration of a decaying mind. Through revelations of regrets and insights, the protagonist, an aging Sherlock Holmes, can finally find his redemption. Gone Girl is a crime mystery, directed by David Fincher to a screenplay written by Gillian Flynn, adapted from Flynn's 2012 novel of the same title. What I did appreciate about the film, beyond the decent story and the fine acting, is the commentary it makes about the condition of our society. Though perhapse nothing new, it still drives home the notion of scandal-greedy TV anchors, of people’s thirsty for contact with celebrities, even if those are murder suspects, and of the ease with which the media can maniplate public opinion. These, along with several other noteworthy topics, make Gone Girl an interesting film. Just be warned that a romantic date flick, this movie is not. Painted Lady is a British murder mystery mini-series, directed by Julian Jarrold to a screenplay by Allan Cubitt. It stars Helen Mirren in the main role. If you enjoyed Prime Suspect and are a fan of Helen Mirren, you will much appreciate the Painted Lady. 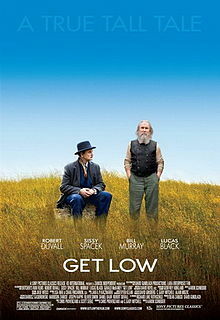 Get Low may be a somewhat small story, but it carries a deeper grain of truth about forgiveness and how it first and foremost must start with oneself. A Cat in Paris is a charming, hand-drawn, action-comedy, animated film, kids and adults will both enjoy. It focuses on a good classic story and well-developed characters.